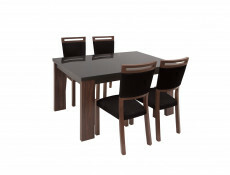 Alhambra dining room furniture range offers a extendable dining table with black tempered glass top. 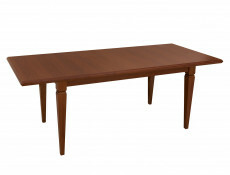 Size: 76 cm (H); 90 cm (W); 140-180 cm (L). 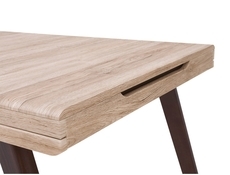 Folds out from 140 to 180 cm when using Alhambra wood colored extension leaf. 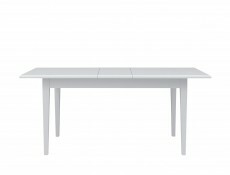 Synchronized extension mechanism allows effortless opening and extending of the table just by one person. 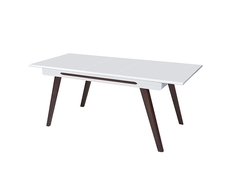 Clean rectangular lines are combined with warm colour of the frame and shiny black tempered glass top to create the feeling of a sophisticated and inviting environment. Matching chairs can also be purchased from our website. 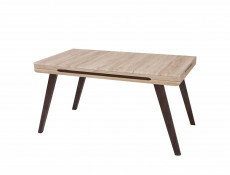 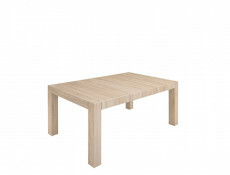 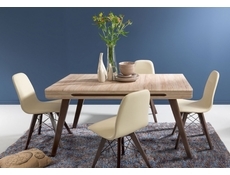 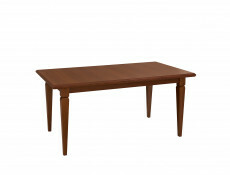 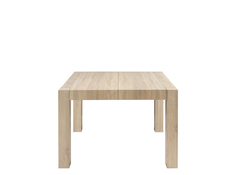 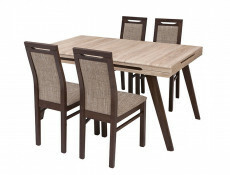 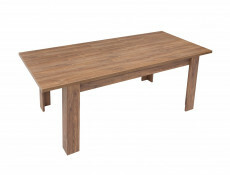 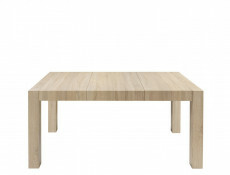 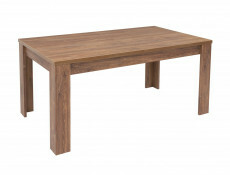 Modern compact Square extendable dining table in sought after Sonoma Oak finish. 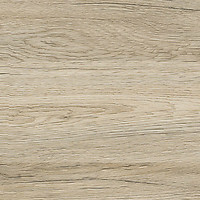 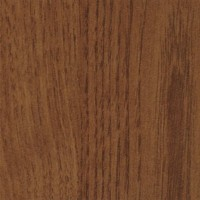 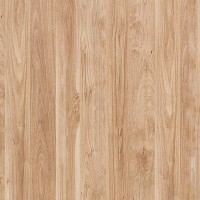 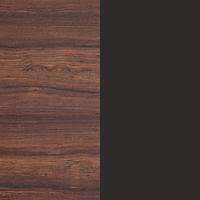 Chunky design, beatufut textured laminate in Sonoma Oak finish that feels and looks like wood and has grainy texture. 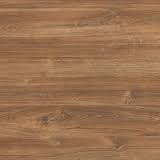 Extra durable laminate on table top. 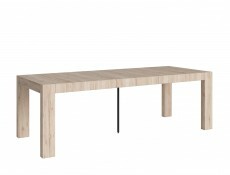 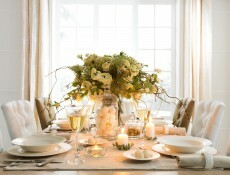 Table extends from 110cm to 160cm by adding middle extension leaf. 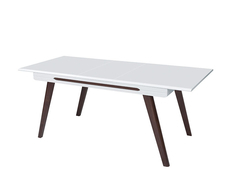 Size: 77 cm (H); 100 cm (W); 110-160 cm (L). Table comes flat packed for home assembly. 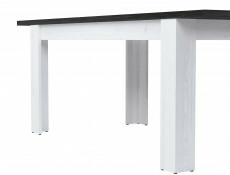 Size: 77 cm (H); 95 cm (W); 180- 240 cm (L). 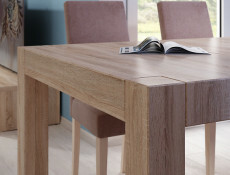 Kaspian extendable dining table is available in four attractive, natural looking finishes that will complement a host of decorative styles. 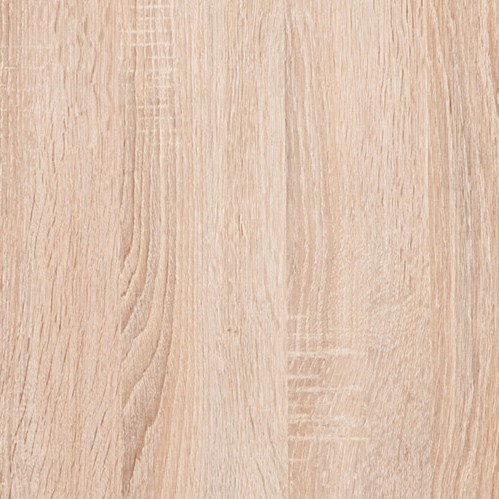 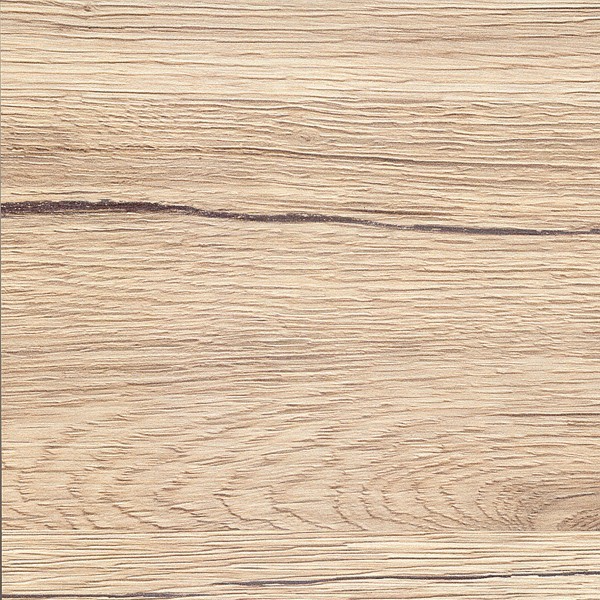 Sonoma Oak is perhaps the most sought after version as it offers a texture and look of real wood with an advantage of a durability of laminate. 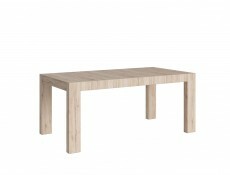 Versatility of colour options makes this table compatible with a number of other furniture ranges such as Danton, Elpasso. 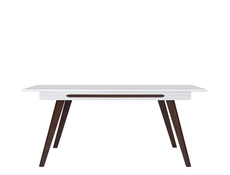 August and Agustyn. 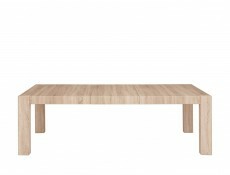 In standard form, this table can accommodate 8-10 people, but extends easily to seat 12-14 when required; ideal for when guests drop by for dinner. 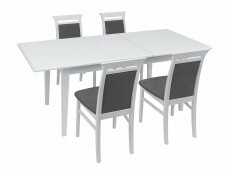 Size: 90 cm (W); 76.5 cm (H); 160-200 cm (L). 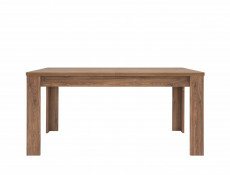 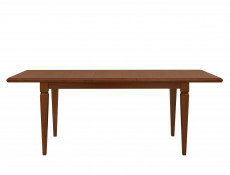 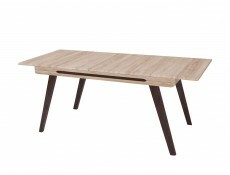 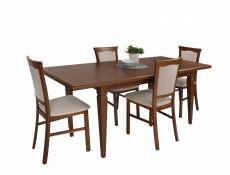 KENT furniture range offers an extendable dining table. 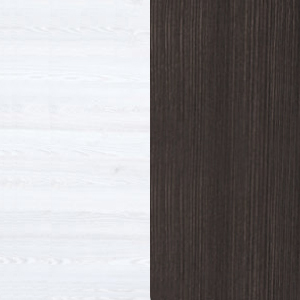 Folds out from 160 to 200 cm.Richly sculpted and decorated cornices, plinths and framed panel facades, combined with subtle handles and bevelled glass edges in the display cabinets, all lend a quaint, olde-worlde charm to your room that will give you immense enjoyment for years to come. 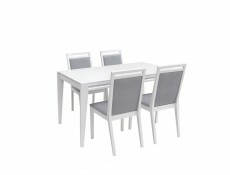 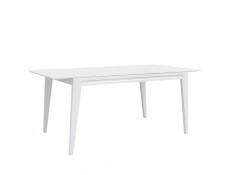 Attractive and unusual modern dining table in White High Gloss with Wenge solid wood legs. 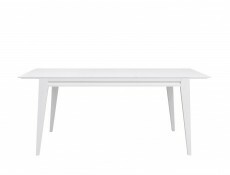 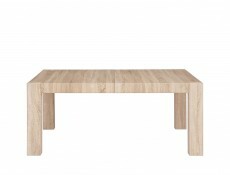 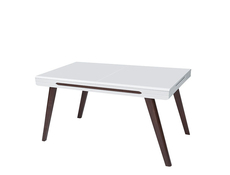 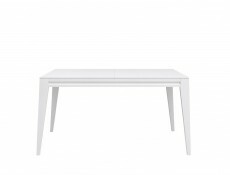 Sturdy solid wood frame with chunky solid wooden legs and MDF white high gloss laminated top. 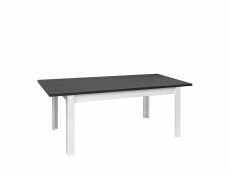 Table extends from 145cm to 185cm. 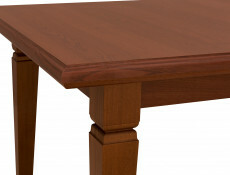 Synchronized glides allow ease of opening. 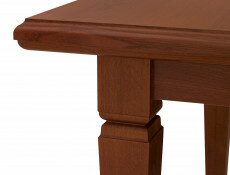 Extension leaf is hidden under a table top when not in use. 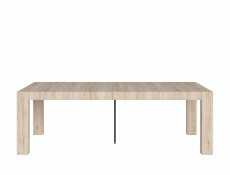 Size: 145-185 cm (W); 76 cm (H); 85 cm (D). 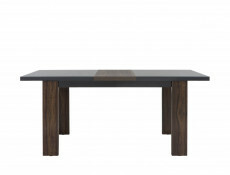 Funky and modern dining table in Oak San Remo finish with Wenge. Table has solid wooden legs and textured wood effect laminated top with extra durable laminate resistant to scratches and stains. 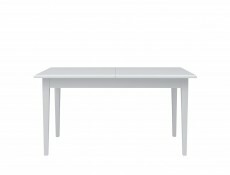 Table extends from 145cm to 185cm. 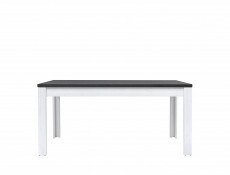 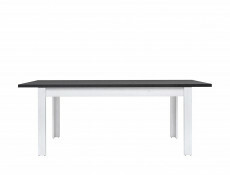 AZTECA ULTRA table is a functional, minimalist, designer dining room furniture range. 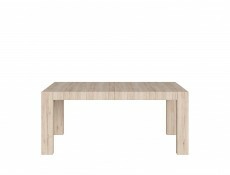 High quality impeccible finish and interesting form will make it a focal point of any room. 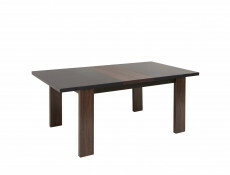 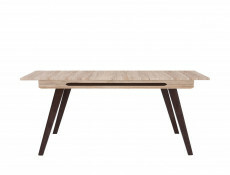 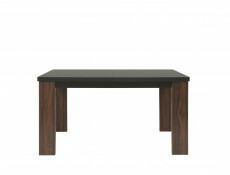 Funky and modern dining table in Oak San Remo light finish with Wenge. 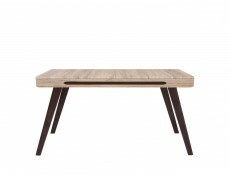 Table has solid wooden legs and textured wood effect laminated top with extra durable laminate resistant to scratches and stains. 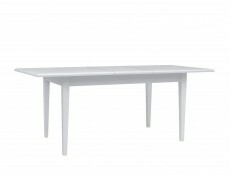 Table extends from 145cm to 185cm. 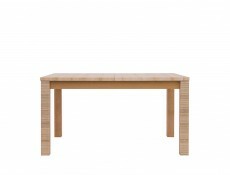 ELPASSO ULTRA table is a functional, minimalist, designer dining room furniture range.